As I mentioned last time, this is a bit of an experiment. All of last week I wrote a short thought every day regarding one aspect of the world of Dark Sun. I sent the thoughts out over Twitter. This blog post now pulls those thoughts together. The theme for last week and for this blog is traveling through the Athasian wastes. 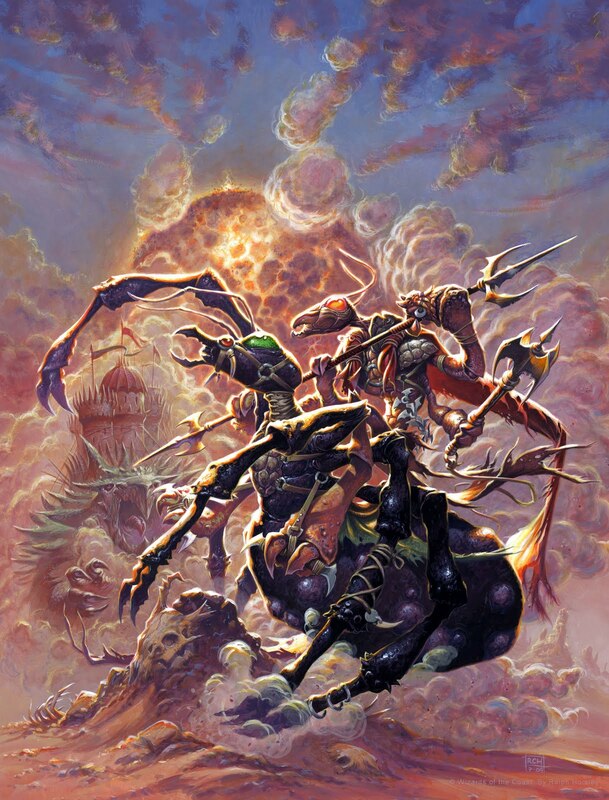 There are many aspects of Dark Sun that make it a fairly unique campaign. Many things that we take for granted in other campaign worlds are incredibly different and dangerous in this campaign. A prime example is travel. In most worlds, the travel from one place to another is almost always guaranteed, with only a wandering encounter posing a real problem. Only the most dangerous parts of the world (such as Iuz’ lands in Greyhawk or Thay in Forgotten Realms) pose difficulties to routine travel. Interestingly, those super-dangerous areas of other campaign worlds are often where the most horrid evils of the campaign world lives. And that’s just one of the keys to Athas – the land everywhere is what you might imagine if the good guys lost and the world was destroyed. Athas is a wasteland, with few heroes and lots of evil. Brutality reigns supreme and there are no guarantees for the PCs, not even travel from one city or village to another. To start with, the land is a very hot desert. Temperatures routinely reach 110 F (43.3 C) by mid-morning and 130 F (54.4 C) by the afternoon. They can reach 150 F (65.6 C) often. That is well above Earth standards, where hot deserts tend to have maximums in the 120 F / 50 C range. The first adventure included in the first edition boxed set had a picture of sweating PCs. I used to bring that out from time to time to remind the players that this happened every day. You don’t really get used to that kind of heat – you just try to survive it. As a DM, you want to drive home this message. As a player, think through how this affects your PC and how you cope with the challenge. How do you deal with being sweaty all the time? With constant thirst? With having to carry so much water and worry about where you will get the next waterskin? With heatstroke? At night, the heat quickly escapes and the temperatures plummet. Athas is frigid at night and no easier to survive. From the brutal temperatures comes everything else. The land is parched and wasted, water and shelter are scarce. Society clings to relatively small cities and tiny villages. Because the history of Athas has left it with few resources (such as metal for good tools) and because the use of magic is guarded by the Sorcerer Kings, there is both the need to travel from one place to the other and yet no way to bypass the dangers. Still, Athasians try. As you might imagine, you don’t want to cross this land on foot if you can help it. A typical Athasian with some coin might hitch a ride on a caravan. Caravans are typically drawn by a mekillot, a half-ton to six-ton thick-shelled lizard that can pull huge rolling caravans behind them. PCs will want to avoid them as it is common for the brutes to take a massive bite out of anyone careless enough to draw close, or even swallow them whole! Being a mekillot handler is not a job that is often held for long! A typical caravan is a huge fortified box with tiny slits and maybe a few openings with crenellations or archery platforms. The incredible heat within is enough that some may not survive the trip from the heat alone. The fortifications are necessary to protect the caravan from raiders, since there is no possibility of outrunning them. Attacks by raiders are very commonplace. Worse, in Athas commerce is controlled by two sets of entities that work in a delicate balance. The first are the Sorcerer Kings that control each city. They control trade carefully, allowing commerce so long as it benefits them. The second are the merchant houses. Each house operates in a very secretive manner, working carefully in a world of scarcity and bloody competition to try to profit where they can and guard against others. Each house competes from behind a veil of tolerance and diplomacy. They do things like send a bard entertainer as a gift… except the bard is an assassin (and usually both sides know it). The merchant houses must also be careful not to raise the ire or greed of the sorcerer kings. It is all a delicate and deadly dance that can turn a routine caravan ride into a very dangerous affair. For all of those reasons, an Athasian with a little more coin and plenty of courage might decide to try to ride across the wastes on their own or in a small group. There are several possible mounts to choose from. Kanks are the most common. Weighing up to 400 pounds, these domesticated insects make for excellent mounts. Looking like a sort of ant with three body sections, they can travel all day at a fast pace. They can eat almost any type of plant and are hardy. When not being ridden hard they will produce a melon-sized globe of green honey prized for its nutritional value (and enjoyed by many giants in the silt sea). Some elves will herd the animals for the honey. Inix are large lizards that can weigh up to two tons and can be ridden. They are strong enough to carry cargo or a small covered structure on their thick-shelled backs. They can also ride day and night. However, they require a fair amount of vegetation to keep their pace and will rebel against their rider if not fed sufficiently. An Inix rider must chart their course carefully to ensure sufficient food for their mount. Crodlu are reptiles that can also be used as beasts of burden. They look like a lizard/dinosaur version of an ostrich (or erdlu) with an oval body, short upturned tail, and long legs with claws. They have a tough scaly hide, but will run from battle unless trained. They can carry a load in addition to a rider or pull a chariot or similar wheeled structure. An erdlu is a common domestic animal, though it cannot be ridden. It is the most common flock animal. Lacking feathers and flight, it resembles a huge 200-pound ostrich with a dangerous beak and claws. Erdlu lay large eggs that can substitute for food and water for up to a week. The animal can be cooked as well, and the bones can be fashioned into weapons or armor. Does your PC wield a spear with a tip from an erdlu’s beak? Is your dagger from an erdlu claw? Perhaps you made your own armor from a wild erdlu you hunted as a youth or your shield bears the scales from an erdlus wings? Do you dream of roasting erdlu over an open fire? As both a DM and a player it can help to know the various options and understand their differences. Does your PC love kank honey? Do you hate the sway an inix makes while riding due to its tail movement? Do you prefer the safety of a mekillot caravan or dream of owning a crodlu? Maybe you are an elf and like most of your kind you prefer to be on foot? Despite the arid climate, there is water on Athas. The precious liquid can be found in oases across the land. However, the oases are both scarce and impermanent. The shifting sands can cover one up and the heat can evaporate it. The few that are permanent tend to have a small village or fortified camp around it and charge a fee. They can also be lairs for people best left alone, such as raiders, escaped slave tribes, and the like. The few that are abandoned can be the most dangerous, either poisoned or home to some terrible creature. Your PC should be very careful when approaching an oasis. At best it may be a time for negotiation or diplomacy. At worst, it may be a time of terrible danger. In a future post we will talk about the many dangers of the wilderness, including what often seem to be common plants or terrain features. Both around an oasis and elsewhere it is important to note any carcasses. It is rare that a body is seen, for both people and creatures will try to extract resources from any felled creature. A body that remains exposed may be a trap, tainted, or suggest a very recent kill. All of these are danger signs. When traveling it is best to consult with merchants or other travelers so as to establish clear routes with sufficient water for a safe passage. Whatever amount of water is required, extra should be brought along. And, always, one should bring either coin and water to buy off those that decide to take a toll or the might with which to repel those asking for it. What is your PC’s approach to an oasis? Are you cautious, waiting to see what happens? Do you lead, striding confidently if warily forward? Do you taste the water first or last? When water supplies draw low, do you share your water or do you eye your ally’s waterskin with great desire? Regardless of the method of travel, the Athasian wastes pose tremendous challenges to even a seasoned adventurer. Both DMs and players will enjoy the setting more if they keep this in mind and role-play the effects. This next week will deal with common PC races and classes. As always, please let me know what ideas you have for improving this experiment. This entry was posted on October 2, 2015 by Alphastream and tagged Ecology, Setting.